Occasionally from a pianist you get the distinct sense that behind the often shapeless playing an honest, thoughtful artist abides. China-born Sa Chen, an award-winning Chopin specialist who turns 37 this year, appeared Saturday night at Jordan Hall in a Foundation for Chinese Performance Arts recital that made this point. The Chopin Barcarolle, which started things off, sounded so undefined, loud and conceptually messy, that I thought something was off with my hearing, or I was simply out of sorts. Chen dramatized a bit of gondola lilt, sometimes the oar moved lightly, and navigation did improve in sureness through the journey. But by the end it still felt like a congested, messy, unmastered trip. And this even though her technique was note-perfect, which proved to be the case for the next hours. Sometime overpedaling didn’t help. Debussy Preludes II returned to indefiniteness, often, and not in the good Impressionism senses. “Mists” was foggier than usual. The “Wine Gate” ’s flamenco came across as danced by one inexperienced at that sort of thing. “Heather” rippled with shadings, but “General Lavine” cakewalked more woodenly than is wanted. “Ondine” nymphed effectively, atmospherically, through the haze. “Canope” aspires to stasis, but again Chen may have overdone it with her note-by-note / no-forward-motion approach. I found her flurries of “Alternating Thirds” deftly rounded in their choppiness, and funny in a way never appreciated before. 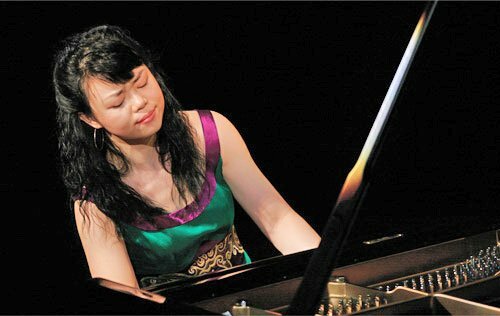 In fact, by now Chen seemed to be getting into it, figuring out the instrument, no longer sweating passage-by-passage execution, starting to enjoy herself and to like what she was doing. “Fireworks” was largely outdoors celebration, low in poetry yet with impressively creamy glissandos and near-glissandos, some solid bangs, then a smashing leading-up to the quiet, where the composer has it just stop. During intermission I moved up to the balcony to hear whether Sa Chen’s sizable potency could cohere better, sounding less thick and episodic. In only some respects does the Liszt Sonata make a good test for that. Chen’s performance showed immense power, foremost, being powerful as all get out yet also with a sameness of texture and dynamics, too-loud accompaniment, and no genuine featheriness anywhere (true of the entire evening). As a rule, it appeared Sa Chen would rather roar. Proper Lisztian grandeur was achieved in the middle, but with the same old dearth of continuity, low interest in pursuit of line, even in short line. I wondered, as with a few other pianists recently, what her advisers tell her about phrase and phrasing. That Liszt fugue was oddly musical, both scampering and scampy, after all of her rousing force, under really impressive control. There is something fragmentary about Liszt’s work; its musical argument, perhaps by its nature, is often not brought to a conclusion. But is the fragment not the purest, the most legitimate form of Romanticism? … form has to remain ‘open’ in order that the illimitable may enter. It is the business of the interpreter to show us how a general pause may connect rather than separate paragraphs, how a transition may mysteriously transform the musical argument. This is a magical art. By some process incomprehensible to the intellect, organic unity becomes established, the ‘open form’ reaches its conclusion in the infinite. Anyone who does not know the allure of the fragmentary will remain a stranger to much of Liszt’s music, and perhaps to Romanticism in general. … the Sonata is one of the glories of the piano literature and Liszt’s greatest achievement as a musical architect. Never before or after was he able to develop and sustain his thought on such an inspired and flawless level within a large form. …Wagner … wrote to Liszt: ‘The Sonata is beautiful beyond all belief, great, lovable, deep, and noble, just as you are.’ The writer Peter Yates asserts that [it] ‘stands isolated as the most successful formal organization of the nineteenth-century stylistic conglomerate…. He spread the single-movement sonata form over an entire large Sonata, … without breaks to distinguish movements.’ The large expanse covered by Liszt was based on his own concept of thematic transformation. The entire work germinates from five themes. Sa Chen’s organization was not very close to the level of the extremely different takes I have heard recently from Pavel Nersessian (intense with wide dynamic range) and Hung-Kuan Chen (slowly refracted atomically). Regardless, the conventionally enormous strength of her Liszt, however organized, well or otherwise, met with a great response. Afterward Chen announced that she ought not to do an encore after the Liszt, but then went ahead anyway, alas, with the weak-tea swirly impressionism of “Autumn Moon Over the Peaceful Lake” in a transcription by the composer Chen Peifun (1921-2006) of a Cantonese folk tune. Two eminent pianists were later overheard praising Sa Chen’s work and noting her successful attempts at achieving colors on the instrument. So don’t let this middling report keep you from checking her out next time through. I might be there myself. Thanks for this fascinating review, which brings some worthy insights to the table from afar. My take on Sa Chen’s performance was that we were in the presence of an artist whose extraordinary knack for pianistic color and articulation was paired with a rather more ordinary aptitude for structure. She reminded me of a painter whose undistinguished drafting skills detract from a positive genius for tints, shades, and layering. To my ears, this tilt toward coloristic virtuosity and away from architectural/temporal coherence was evident from the first measure of Debussy, Les collines d’Anacapri, but clearest in Livre II – for example, where General Lavine, splendidly attired as he was, often seemed to herk where the composer wanted him to jerk. Likewise, for the sublime Canope to truly hover suspended in air, the time has to be invisibly steady, but Sa Chen’s expanded and contracted unaccountably, and was not helped when she lost her way a few centuries from the end. Still, though, I don’t think anyone plays Les Tierces Alternées any better than we heard on Saturday night – as Mr. Moran noted, there was a sparkle of humor to this that one never hears but which Sa Chen convinced me the old man fully intended. One more thing…an oddity: I had the likely-never-to-be-repeated experience of hearing two Chinese piano virtuosi in concert do the very same thing within 2 hours of each other: follow a powerful performance with a lackluster, poorly chosen encore. Lang Lang’s after Prokofiev 3 was an intermezzo of Manuel Ponce – tea hardly stronger than Chen Peifun’s Autumn Moon. What’s up with that, friends? Thanks much, again, for usual astuteness of comment and elaboration. A decade-plus ago SC played in competition with unusual simplicity and straightforwardness and musicality, almost Kempff-like, and I hear no lack of line.